BUTLINCAT's BLOG: THERE'S A LOT OF IT ABOUT: Crooked lawyer, 67, who stole almost £4million from her firm and spent the cash on stays at the Ritz, clothes, wine, and holidays is jailed for seven years HURRAH!!! THERE'S A LOT OF IT ABOUT: Crooked lawyer, 67, who stole almost £4million from her firm and spent the cash on stays at the Ritz, clothes, wine, and holidays is jailed for seven years HURRAH!!! A crooked lawyer plundered almost four million pounds from a 200-year-old firm to live the high life. Scheming Linda Box, 67, forced the historic Yorkshire solicitors to close down after stealing millions from client accounts at Dixon, Coles and Gill. The senior partner, who had an 'obsession' with buying clothes, abused her position to fund a lavish lifestyle including £800-a-night stays at The Ritz and a collection of vintage wines worth £800,000. She funded mortgages for friends, paid private school fees for her granddaughter and splashed out on landscaping work at her home and fancy holidays abroad. Box even stole £63,000 of Church of England cash belonging to the Bishop of Wakefield's Fund when she was a registrar. Box was jailed for seven years today at Leeds Crown Court after admitting nine counts of fraud, two of forgery and one of theft. 'all because of your unrestrained and out of control greed'. Leeds Crown Court heard the total value of the 12-year deception at the law firm was £4,055,329. Police were contacted when it was realised more than one million pounds was missing. Officers discovered Box forged the signature of another solicitor on probate documents. The firm, which had offices in Wakefield and Horbury, shut down in January last year when the fraud investigation was launched by police. Dixon, Coles and Gill's offices have now been sold off and staff made redundant as a result of Box's actions. The police investigation also uncovered Box's offending while she was registrar and legal adviser to the Diocese of Wakefield. Part of her role included looking after church funds. Details of transactions in Box's handwriting were found in a ledger book which purported to have been done on behalf of the Bishop of Wakefield Fund. Some 75 client files, many involving estates of deceased, and ten files relating the church showed misappropriation. The prosecutor added the consequences of Box's offending were 'enormous'. Mr Justice Blake said the scale and enormity of the breach of trust was 'staggering' and she had 'fobbed off' anxious relatives. Joe Hingston, defending, said: 'Through me she has asked to express her complete remorse for what she has done and she recognises the devastating impact of her behaviour, the wholesale breach of trust and as much as she is able she will make every endeavour to compensate the victims in this case. 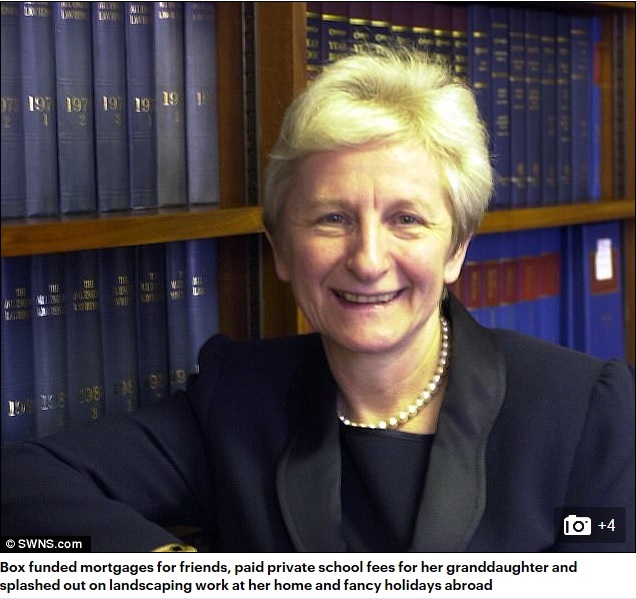 'She had already been struck off after more than 40 years as a solicitor.